Every Saturday, whatever the weather, our Healing On The Streets teams take to North Finchley High Road to offer prayer to whoever wants it. The teams meet at 11am at Costa Coffee shop on Finchley High Road to pray, before going to the area known as Tally Ho where from 12noon to 2pm they hand out leaflets and invite passers-by to come and receive prayer ministry. It’s one of many ways we try to fulfil the Lord’s commission to ‘Go’, and so far it has yielded a great deal of fruit in the form of physical healings and entirely unchurched people coming to know and follow Jesus. 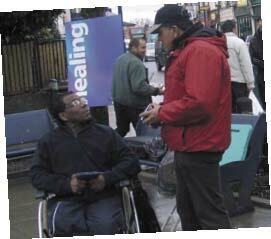 For more information or to volunteer, email Dave Harvey or call 020 8343 5770.